Kuzanga Marimba of Santa Cruz, California plays traditional and contemporary music from the Shona culture of Zimbabwe. 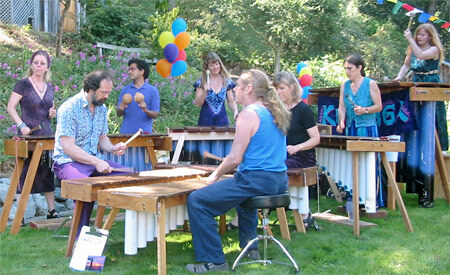 We play seven marimbas ranging from soprano to bass, along with hosho (gourd shakers). Kuzanga has been a favorite of ethnic-music enthusiasts since 1994. Several generations, from young to old, often dance to this exciting music simultaneously. We are all acoustic, so require no amplification. Find out about our CD and listen to music. Kuzanga performs at Play It Forward festival at Louden Nelson Center in Santa Cruz from 1:15 – 2:15 pm (time is tentative). We are available to entertain you at private parties, holiday events, weddings, and birthday and graduation celebrations.